The world’s first real-time architecture festival is coming to Long Island City in 2012. To prepare for the event, we invite residents, professionals and city officials to an action packed day of ideas, fun and inspiration. Change in the public space is seen as difficult and slow. Let’s challenge that notion. Let’s ask: Can a city respond to change as it happens? Who is responsible? Where are the resources? What can we do? We invite you to explore these questions with us, and come up with answers we could not have imagined. Our goal is to open up the process, encourage change and participation in city planning and foster new ideas about what can be done in public space. 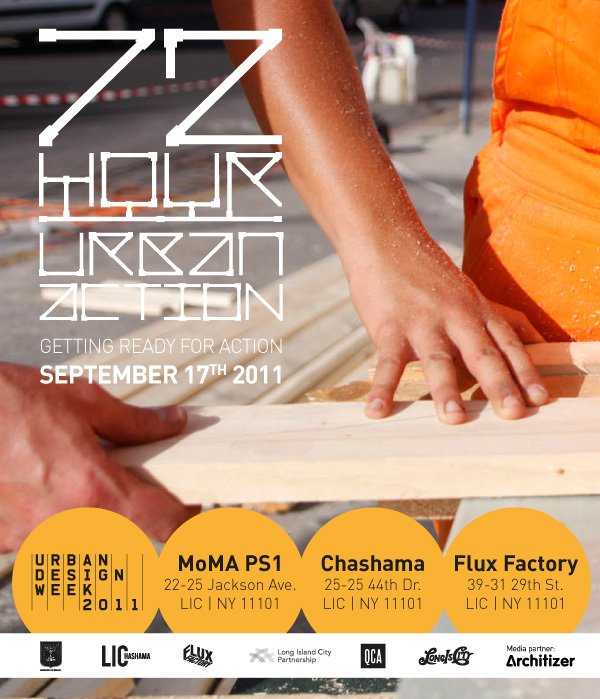 72 HOUR URBAN ACTION is the world’s first real-time architecture festival. 100 participants in 10 international teams, have 3 days and nights to design and build projects in public space. The first edition took place in 2010 in the Bat-Yam Biennale of Landscape Urbanism, and the next will take place in 2012 in Long Island City! In preparation for the event, we invite you to join us for a day of brainstorming sessions, inclusive public planning workshops, talks with professionals and city officials, and a guided tour. And to top it off, join the festival’s founders for a party at Flux Factory. An exploration and contemplation of independent urbanism. Participation is free, but space is limited. RSVP is required. Thursday November 12th Dinner at 7 pm. Presentations begin at 8:30 pm. The event is free, but please do bring something edible to share!